Today I’m sharing with you a WIP. And if you’re not down with the acronym lingo, that’s a work in progress. I actually started this in February after my dad and I did over my craft room/office. Realizing that I had tons and tons of yarn in lots of colors, and not enough to make much of anything with them I got on with some serious stash busting. I filled up a trash bag with the yarns that were taking up way too much space and decided to do something with them. 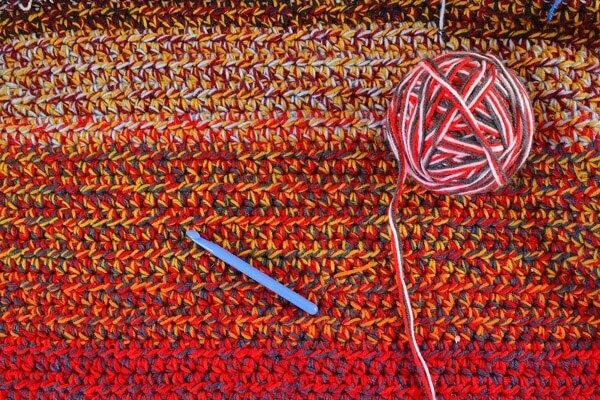 It also just happened to be very chilly in the house so knocking out an afghan was dual purpose… I used up my yarn and I kept warm at the same time! And all was going well but I was sick or something and I quit counting. NEVER QUIT COUNTING! My finished afghan spread across the bed I noticed just how wonky my edges and become and it just wasn’t going to do. Bah! The only thing to be done is to unwind it and start again, which stinks because if I remember correctly, this is already about 5 hours of crochet time. BUT I’ll have something to keep my lap warm as I’m getting chilly in this house all over again! The idea is pretty darn simple. 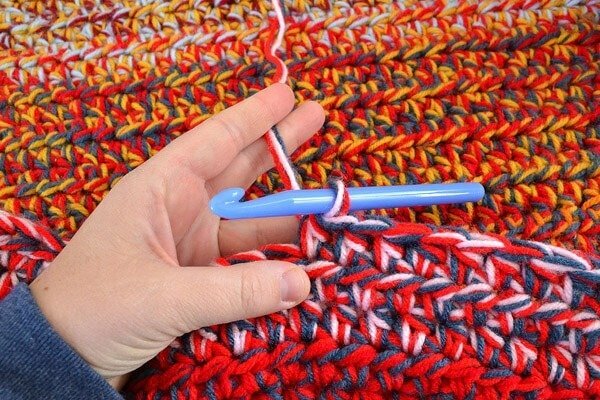 Grab 3 skeins of complementary yarn and grab a P crochet hook. Now mine is in a ball because I’ve already started tearing my afghan apart. 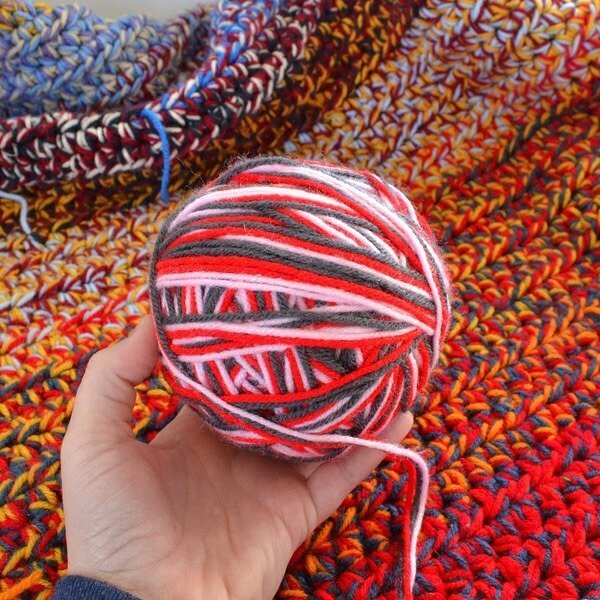 If you prefer to work with a ball of yarn, by all means ball it up but it is kind of difficult with 3 yarns at a go because it isn’t likely that your scrap stash is going to have 3 skeins of yarn all the exact same length. The way I like to do it is I just set my 3 skeins nearby one another and to the side of me while I work. One thing to consider is how your color will change or graduate. I started with violet, mustard and a light blue. When ran out of gold I changed it for white. When I ran out of white I changed it for gray. After my first go I decided that it would be a good idea to add the new yarn that was in the same color family. So when I ran out of sky blue I started in with cobalt and when that was gone on to navy. And the colors together started being awesome! 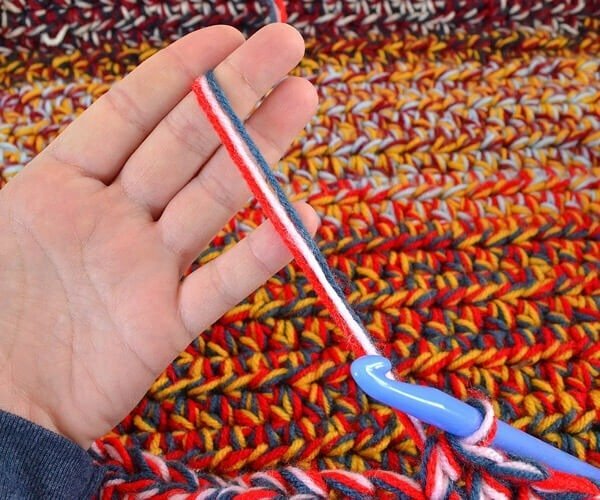 To work your yarn, simply hold your three strands as you would one. I actually like this a bit better than super chunky yarn, because it is thinner in between your fingers. And for some reason that super chunky yarn tends to fatigue my fingers more quickly. And work it like you normally would (see cats don’t see the difference). 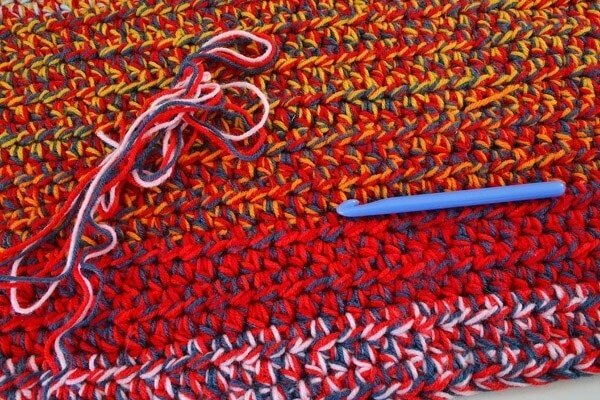 The one thing is if you’re really new to crochet, you might have a time taking off that many loops in a go, but with practice it’ll be a piece of cake. For this afghan I wanted to be both thick and dense making it a super duper warm afghan to cuddle up with. Just note, that also makes it quite heavy! I worked this afghan with a half double crochet, but you can do any stitch, any pattern! I busted my stash, made a really pretty and totally one of a kind afghan and had a nice time doing it. Unfortunately I’ll get to do it all over again but as it has been 8 months or so, it won’t be nearly as painful to start tearing this sucker apart :) COUNT YOUR STITCHES! I’ve made similar things, afghans, rugs, cat blankets. 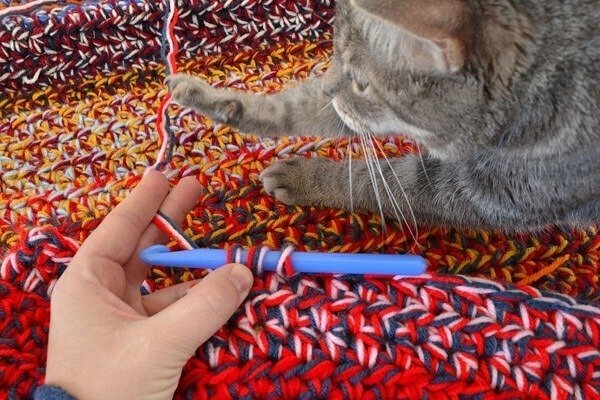 Mostly I used single crochet – less chance of threads being pulled by claws. 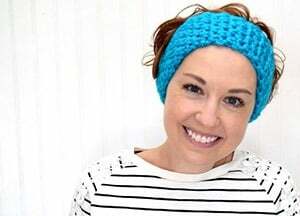 It’s a great way to use leftovers from years of knitting and crochet. Like you, I prefer several fine or medium threads to one chunky. 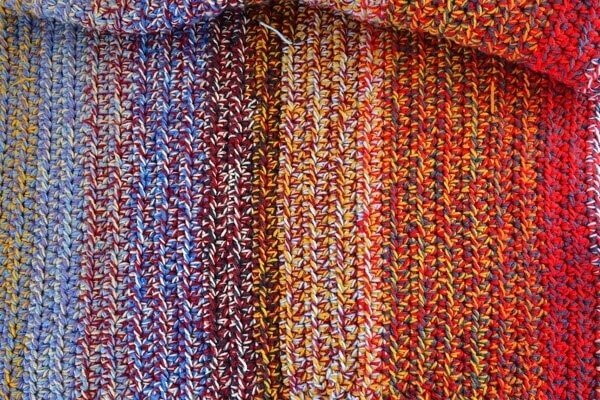 It gives a denser fabric and so much scope with colours. 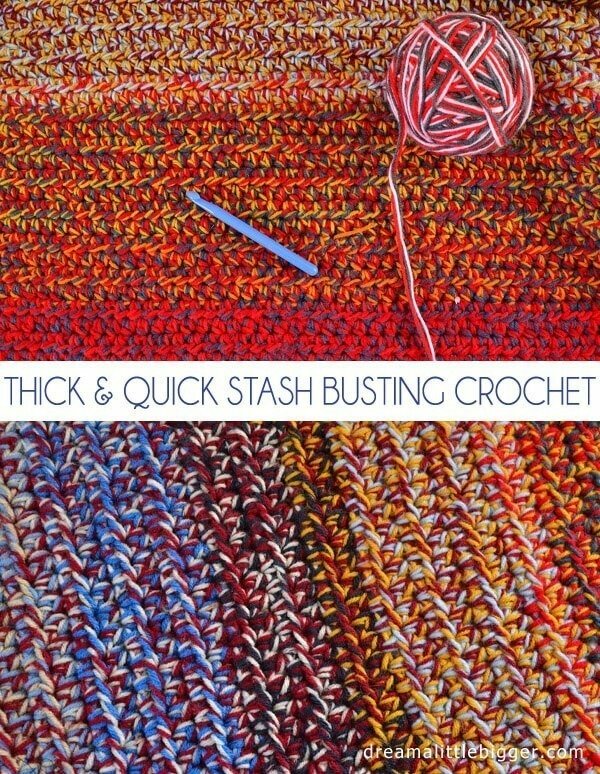 Your blanket is lovely, a great stashbuster! 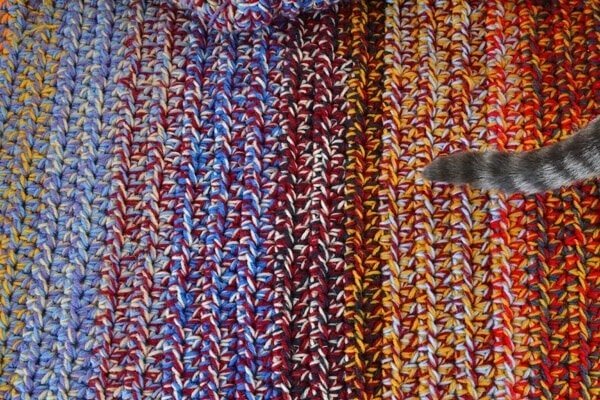 Most of all, I enjoyed photos of your darling cat, playing with the yarn, so happy. Blessings to you both, and enjoy the handwork!! i love a scrappy afghan. And I never count! I love your blankets. I have got lots of odd balls of wool. 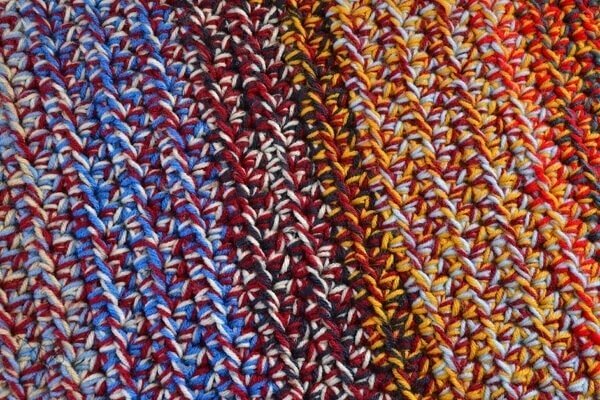 How many stitches would I need for a throw. Thank you.